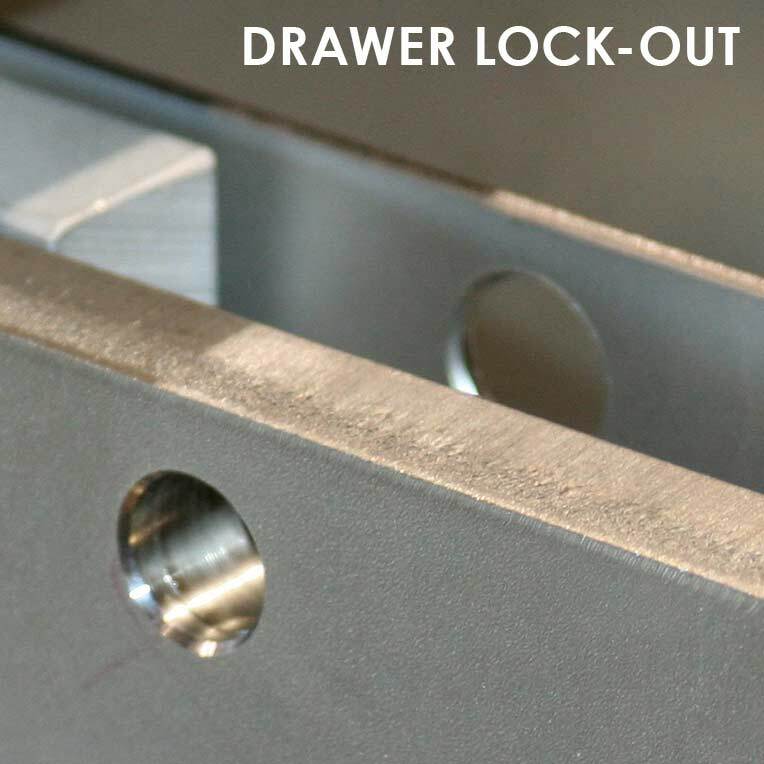 Our Drawer-In-Housing magnetic separators, also known as Drawer Magnets or Grate In Housings, consist of rows of round magnetic tubes that are assembled into drawers. The magnetic tubes of each row are aligned on alternating centers from the row directly above or below it. As product flows into the top of the housing, it is forced to cascade in a zig-zag pattern from row to row over the magnetic tubes. 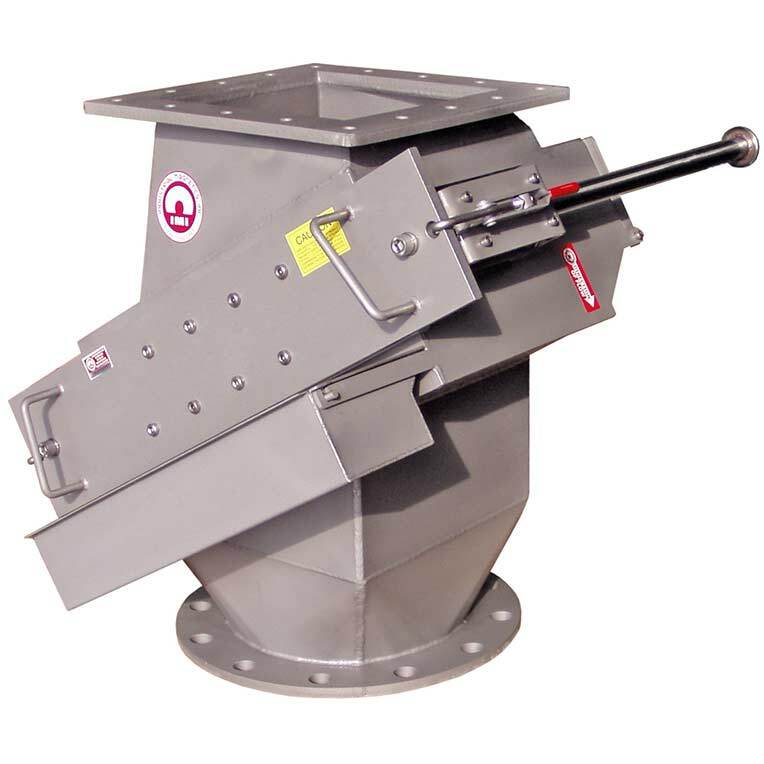 This ensures maximum tramp metal capture since the product comes in direct and repeated contact with a magnet as it travels through the housing. As ferrous metal passes through the magnetic field, it is held to the tubes and separated from the product. The metal must now be cleaned from the tubes on a regular basis to prevent buildup and subsequent wash-off back into the product flow. 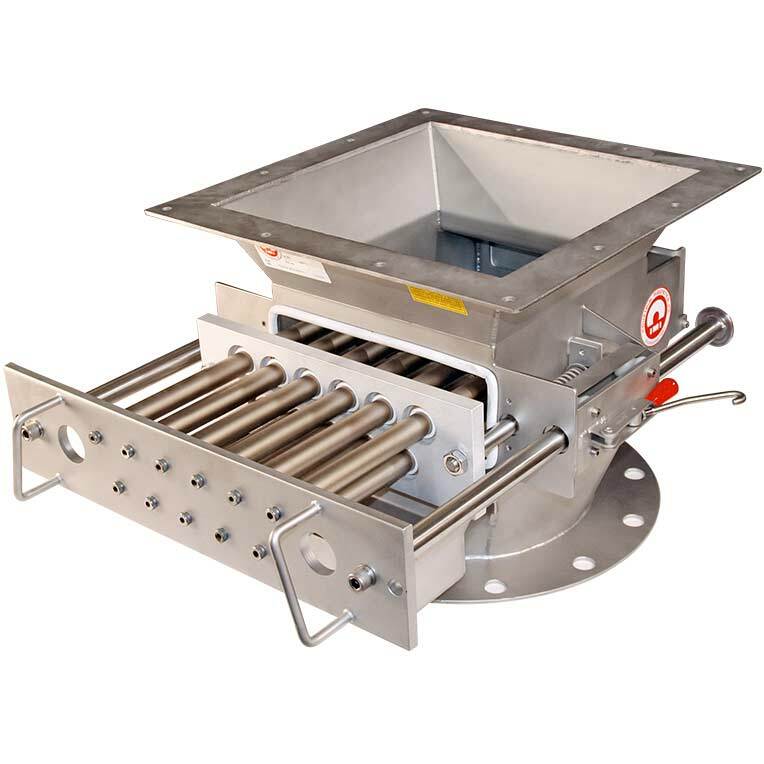 Self-Cleaning Magnetic Drawer-In-Housing Magnets are ideal for hard to reach locations, removal of fine tramp metal, or an automated processing plant. A toggle switch allows the operator to actuate the cleaning action from a remote location. In seconds, the air-actuated stripper device discharges collected tramp metal outside the housing. 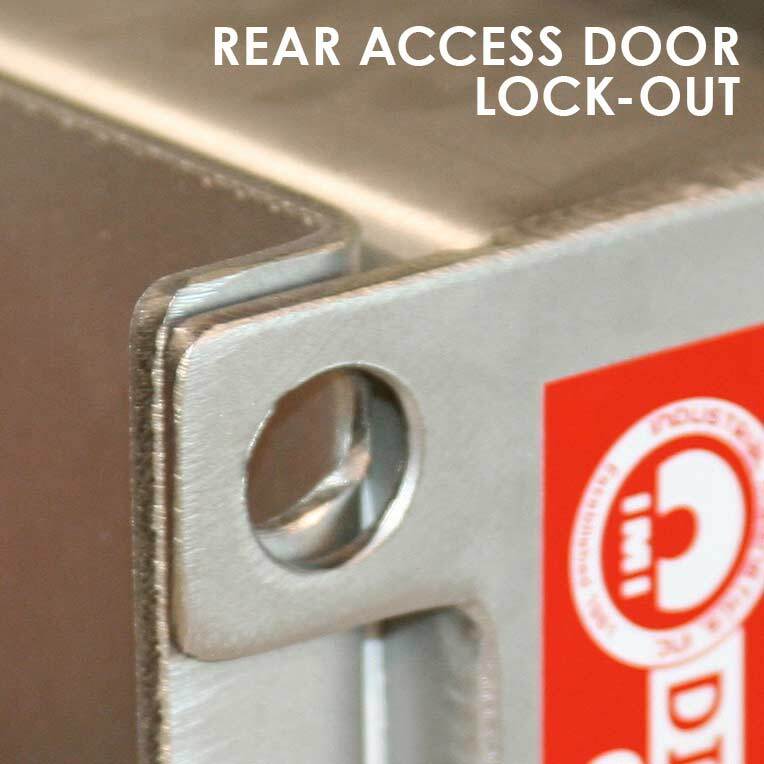 Standard sizes range from 6"x6" to 24"x24" inlets and outlets in even increments. Custom sizes are available upon request, as well as transitions to match existing equipment. 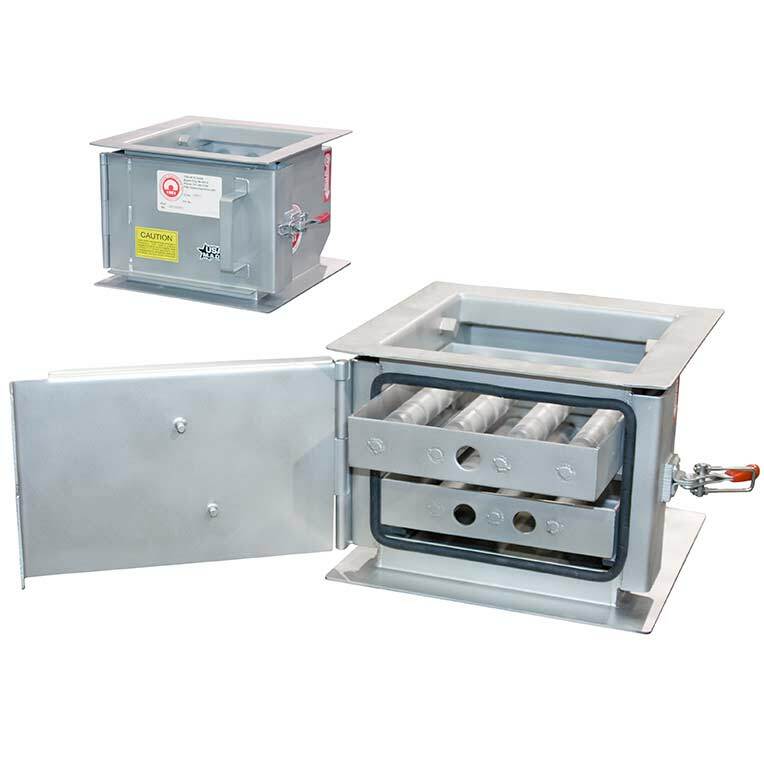 Continuous-Clean Drawer-In-Housing Magnets are ideal for remote magnet installation locations, applications requiring frequent cleaning and fully automated processing systems. The patented design and cleaning process (U.S. PATENT NO. 8,132,674) is continuous and does not require the product flow to be stopped. The cleaning cycle is completed in a matter of seconds. 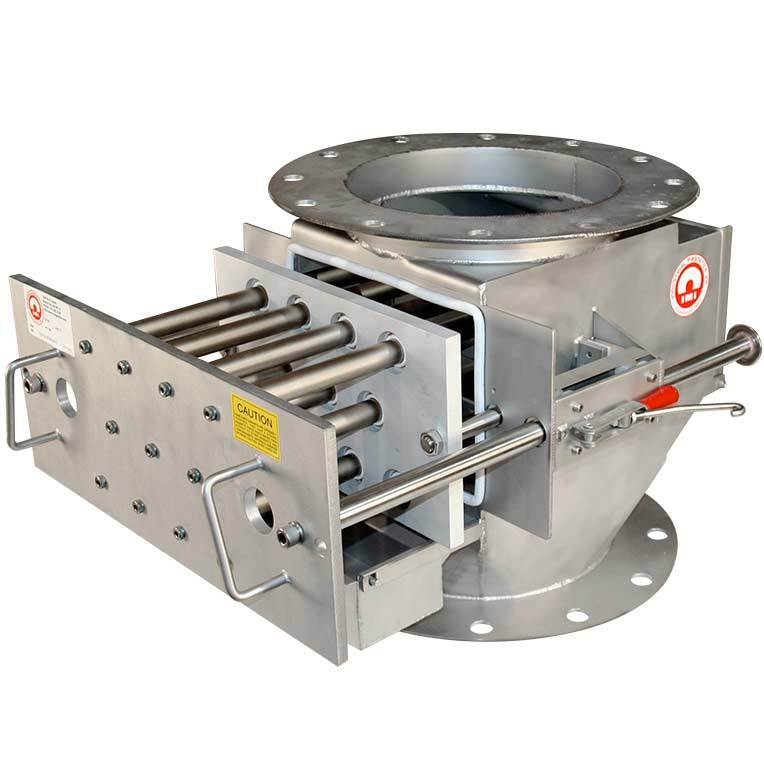 The air-actuated stripper seal assembly discharges collected tramp metal into a leak-proof enclosure with a discharge chute that ensures clean operation and isolation of possible hazardous materials. 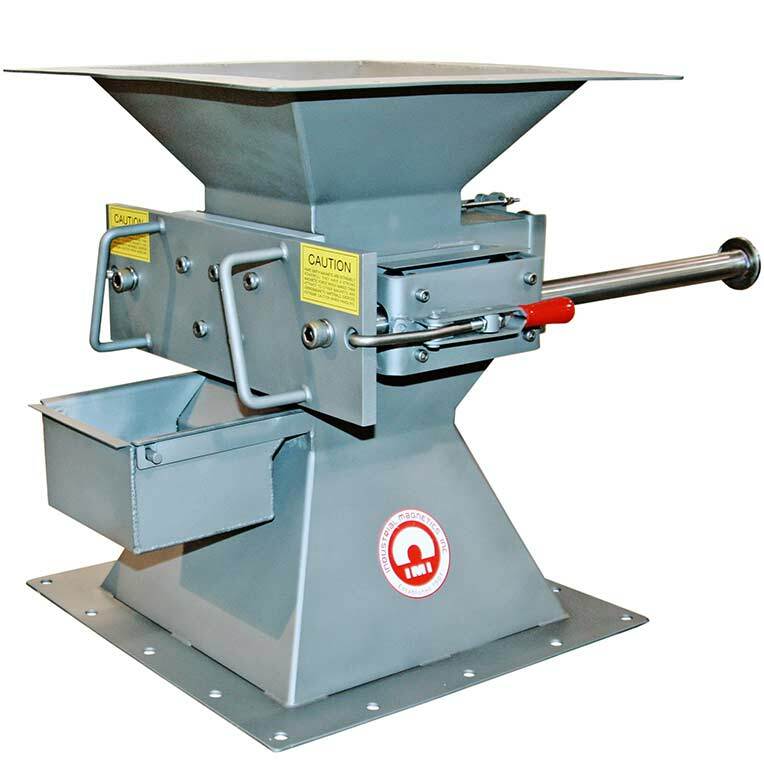 The EZ-Clean Drawer-In-Housing Magnets are designed to simplify the cleaning process for quick removal of collected tramp metal. To initiate cleaning, the operator pulls two handles on the front of the housing which removes the magnetic drawer from the product flow. As the drawer is pulled out, each magnetic tube passes through a seal which wipes the accumulated metal from the tubes. 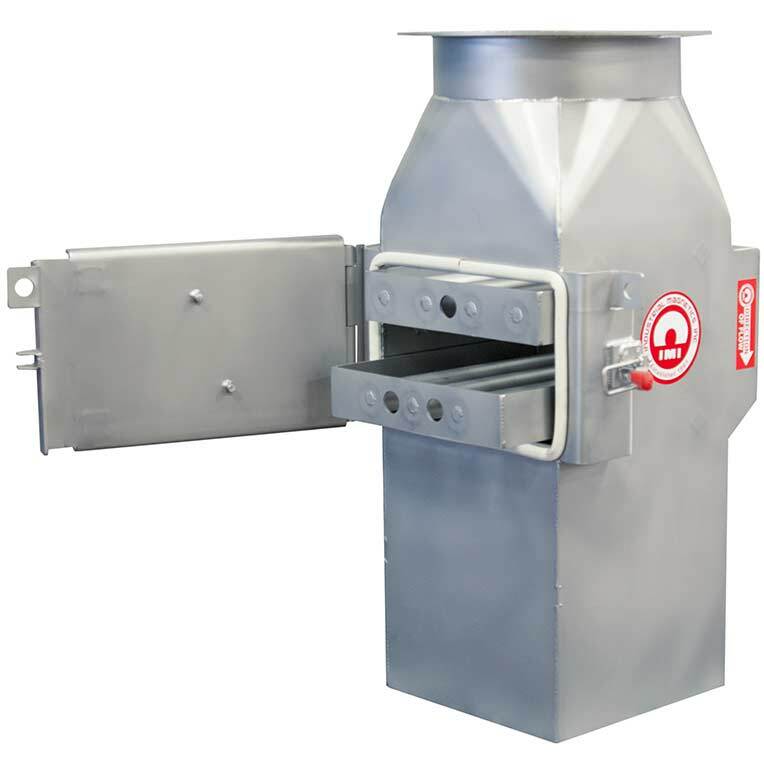 A catch pan is located under the tubes on the front of the housing to collect the metal for proper disposal. SimpleClean™ Drawer-In-Housing Magnets are ideal for applications with low levels of tramp metal contamination. 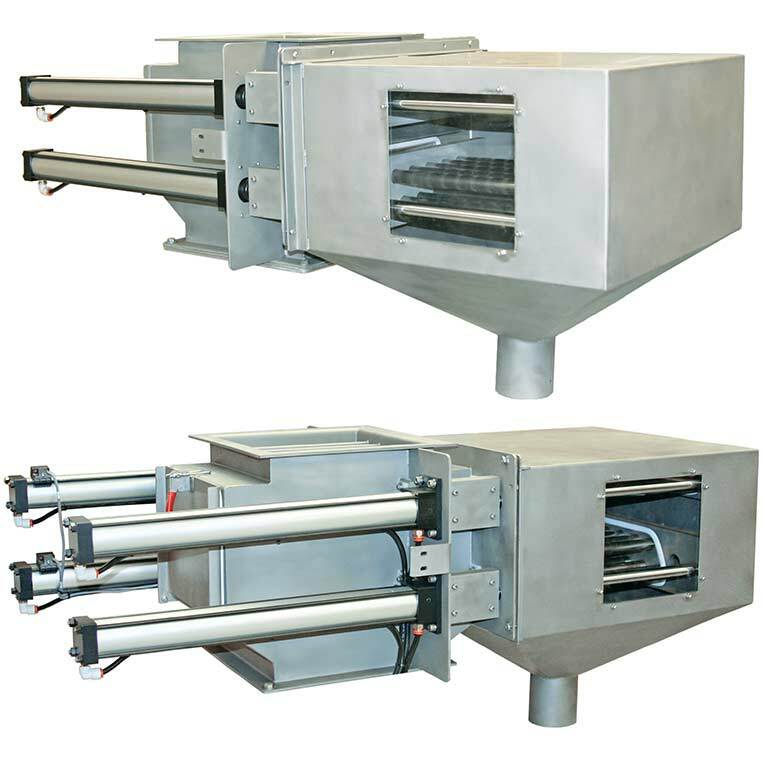 The housing consists of two or more magnetic row(s) of extended tubes that contain a non-magnetic area that is located in the back of the housing and outside of the product stream. To clean a row of magnetic tubes, open the hinged door; remove one row of tubes at a time. 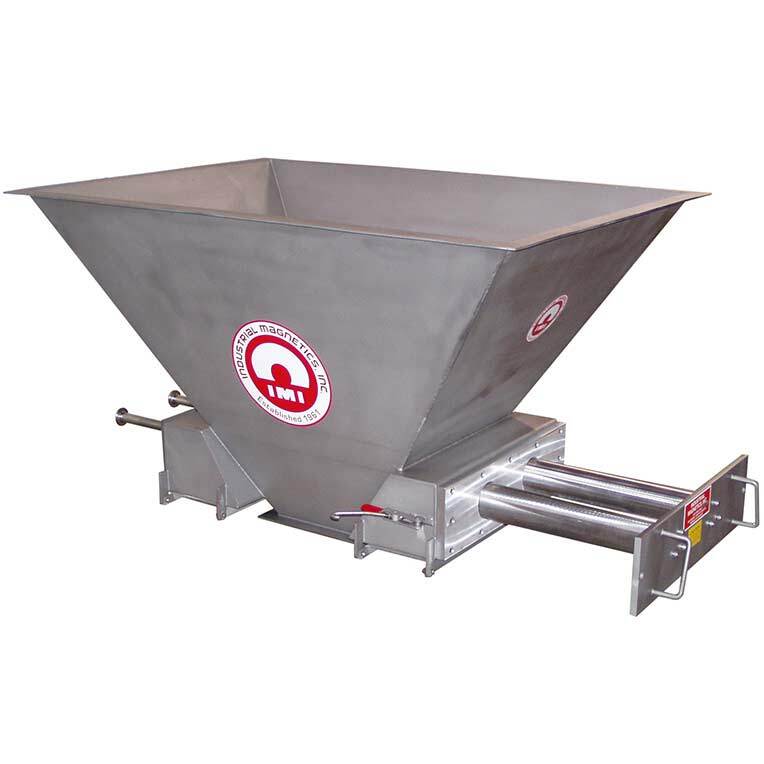 Over a container, simply wipe collected metal on the tubes until it reaches the nonmagnetic area located at the end of the tubes. Collected metal falls off. 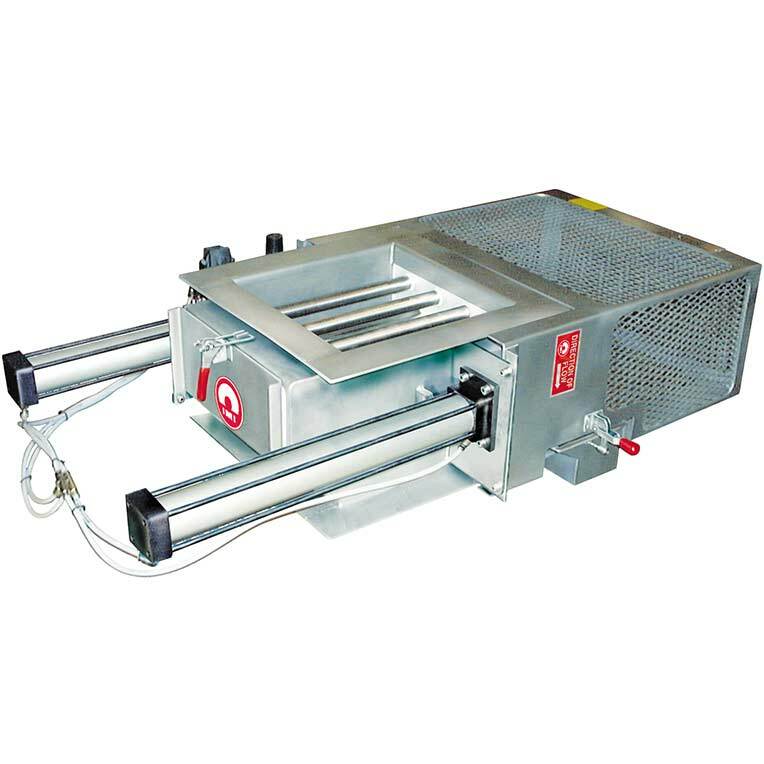 Our Sanitary Grade Drawer-In-Housing Magnets, with HACCP magnetic circuit, are certified by HAACP International and fully conform to HACCP International's Food Safety Standard (0909MAGSEP 1-2010) for direct contact with food product. 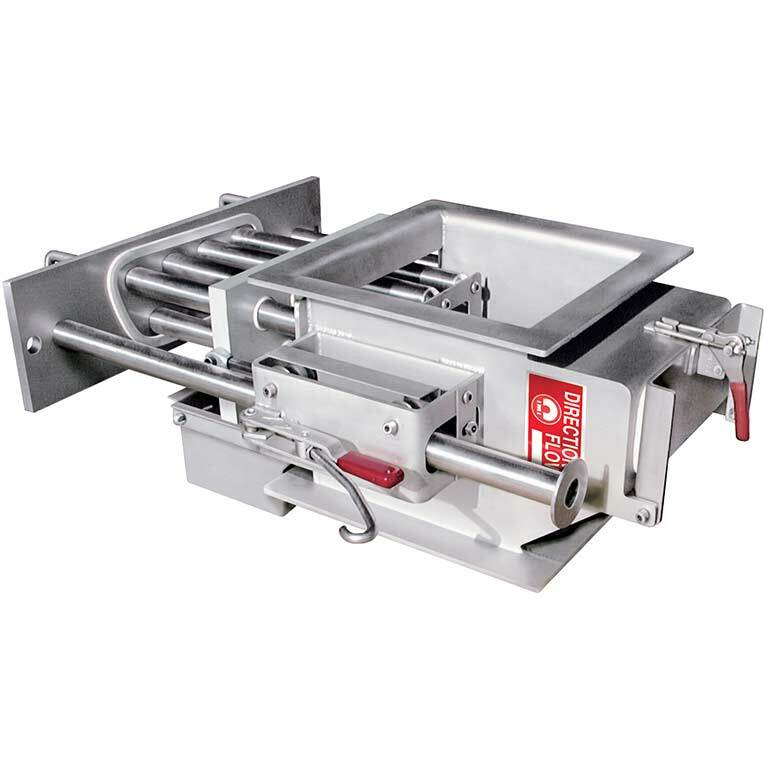 Our Sanitary Grade Drawer-In-Housing Magnets are USDA AMS accepted Dairy, Meat and Poultry magnetic separator processing equipment.